Keeping delicate surfaces safe from moisture, spills and drips is a priority in many households. Instead of investing in a new set of ceramics to keep glasses and cups from leaving marks, consider repurposing a soda can to get the job done. The aluminum surface creates a durable barrier between a cup and a tabletop. When you add a cork base, surfaces are sure to remain in their pristine and original condition. Creating a coaster from a soda can comes with the added benefit of including the display of a well-loved label within a décor scheme. Feel free to mix and match labels for a set of colorful and unique pieces that also keep stains away. 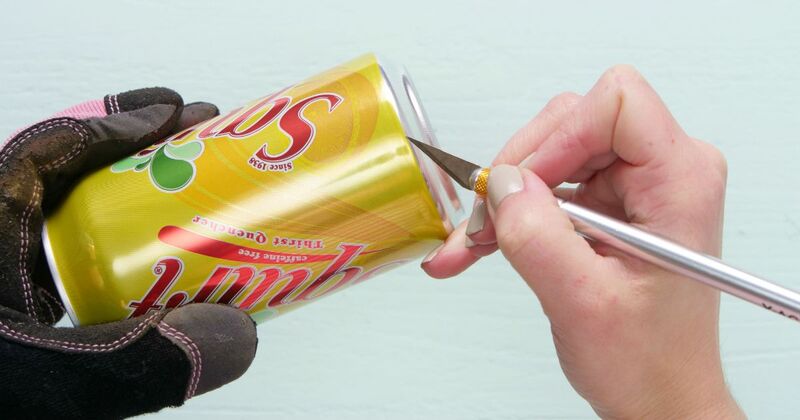 This time-efficient project requires a precision knife and some glue to easily transform a soda can into a highly-useful household product. 1. Place a 4-inch round cork coaster on a flat surface with the raised rim facing up. 2. Center the piece of yellow construction paper on top of the cork coaster. 3. Press a thumbnail into the yellow paper following the circumference of the cork coaster rim. This will create an indentation that acts as a stencil. 4. Trace the indentation of the circle on the paper with a permanent marker. 5. Cut along the line to remove the circle from the paper and place to the side. 6. Put on protective gloves and place a soda can lengthwise on a flat surface. Cut away the top and bottom lids with a precision knife. 7. Stand the soda can upright and use the precision knife to cut a line from top to bottom, allowing the aluminum to be rolled out flat as a single piece. 8. Smooth the aluminum flat with the label facing up. Use a piece of painting tape to secure the yellow circle as a stencil over the portion of the label preferred to be used for the coaster. 9. Trace the paper circle gently with a precision knife to define the portion of aluminum to be removed from the larger rectangle of material. 10. Remove the yellow paper circle and move the aluminum to a protective measuring placemat. 11. Trace the circle with a precision knife, using a more forceful cut, and completely remove the aluminum circle. 12. Place the cork coaster on a flat surface with the raised rim facing up and cover the inner circular surface generously with E6000 craft adhesive, avoiding the rim. 13. Press the aluminum circle with the colorful label facing up on top of the adhesive and hold. Place a large mason jar on top to help the aluminum dry flat to the cork base. 14. Cut a 7-inch length of silver craft wire with wire cutters. 15. Place one end of the wire between the aluminum circle and raised cork rim, following the circumference until ends meet. Cut the wire to fit the coaster. 16. Place a spot of hot glue underneath each end of the wire to secure. Add a small dot at the top of the circle to firmly attach it to the coaster. 17. Wait until the coaster is dry before using it.